#CookoutWeek 2018 is here! During the next week, I am joining over 50 of my blogger friends to celebrate summer by posting delicious cookout-themed recipes. If you love grilling, frozen treats, picnics, berries, s'mores, campfire meals, and other summer goodies... you are in the right place! To kick things off, I've sharing Colorful Quinoa Brown Rice Salad, a recipe that I've adapted slightly from Taste of Home. Back in October, I changed my eating habits, and part of that change was trying new things. Quinoa was on the list to try, and I've found a brown rice/quinoa blend that I love. When I saw the recipe for this salad, I used that as the jumping off point, and then followed the rest of the recipe as it was written. While the quinoa and brown rice cooked, I chopped all the veggies. So many beautiful colors and textures. I keep my gingerroot in the freezer, and used a microplane to grate it. That really helped it get distributed evenly throughout the dish. This comes together so quickly, and it gets better as it sits. I just gave the lidded bowl a shake when I passed by the fridge. It was the perfect side to some burgers, and it was awesome with some leftover diced grilled chicken rolled into a multi grain tortilla. Next time I might even add some diced jalapeno. Thank you to Catherine T. for sharing her recipe! This week, we are also hosting a HUGE giveaway thanks to our generous #CookoutWeek sponsors. Enter below to win. Thank you so much to Allison at The PinterTest Kitchen for hosting this awesome event. Really looking forward to all of the amazing recipes! In a large saucepan, bring water to a boil. Add quinoa and brown rice. Reduce heat; simmer, covered, 12-15 minutes or until liquid is absorbed. Remove from heat; fluff with a fork. Transfer to a large bowl; cool completely. Stir spinach, tomatoes, cucumber, peppers and green onions into quinoa. In a small bowl, whisk dressing ingredients until blended. Drizzle over quinoa mixture; toss to coat. Refrigerate until serving. Char-Broil Classic 280 2-Burner Liquid Propane Gas Grill from blog hosts The PinterTest Kitchen. This grill has 280 square inches of cooking space over porcelain-coated grates and two 12-inch side shelves for extra prep space. A Red KitchenAid Mixer and 5 Flavored Butters from our friends at Chef Shamy. Make the World a Butter Place® with Chef Shamy! The winner will receive Garlic Butter, Cinnamon Brown Sugar Honey Butter, Vanilla Bean Honey Butter, Strawberry Honey Butter, and French Onion Butter with Asiago Cheese to use in your favorite cookout recipes. And if you just can't wait, use 10BUTTER10 starting today to get 10% off your Chef Shamy butter order on Amazon. These butters contain no oil, and the savory butters are perfect for keto recipes. A Duck Product Pack from our friends at Maple Leaf Farms consisting of 2 pkgs All Natural Boneless Duck Breasts (7.5 oz), 2 pkgs Fully Cooked Roast Half Ducks w/Orange Sauce (14 oz), 1 pkg Duck Bacon (12 oz), and 1 pkg All Natural Duck Legs (16 oz). Maple Leaf Farms is celebrating its 60th anniversary raising White Pekin ducks on local, family-owned farms. Butter-flavored Organic Coconut Oil from our friends at Barlean's. This dairy free option offers all the healthy benefits of organic coconut oil, with the rich taste of butter. It's great on toast, popcorn, baked potatoes, or cooked vegetables. You can also substitute it 1:1 for butter in baking, cooking, and frying, and of course it is perfect as a butter substitute for all your favorite cookout recipes. 24 Cartons of Vinegar Shots from our friends at Vermont Village. You'll receive 12 cartons of turmeric flavor and 12 cartons of cranberry flavor. Each carton contains 12 individual, 1 fluid ounce vinegar shot pouches! This raw, organic apple cider vinegar has rich flavors from whole foods and is sweetened naturally with honey. What a great way to "eat a rainbow" . This is a gorgeous salad Jolene. Another reminder that I don't use quinoa nearly as often as I should. This looks like a lovely summer side! I'm just sorry I waited so long to try it! 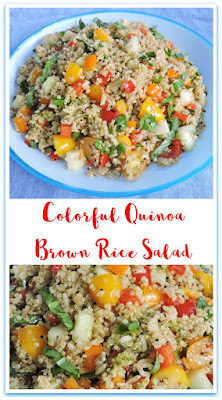 It just so happens that I recently made a whole bunch of quinoa, so I'm definitely looking forward to making this hopefully soon! :]! Love all the colors!! This is just about the most nutritious salad ever! And beautiful! I need to break out the quinoa. Such a healthy option for a cookout.